The opportunity to explore the heart of Moscow, Saint Basil’s Cathedral. One of the world’s most renowned landmarks built back in 1555 and for many, continues to remain the symbol of Russia. Saint Basil’s Cathedral has been an integral part of Russian history, this famous church was on the Red Square long before the first Romanov dynasty came to power and survived both a war with Napoleon and World War II. Thankfully, time has remained favorable to this great cathedral and now you can see it with your own eyes. Go inside and admire the nine small churches all hidden under the one roof. You can walk around Red Square and see where history was made with merchants, farmers, revolutionaries, soldiers, and Soviet citizens all calling Red Square their home. Go inside of the GUM Department Store and imagine when the store first opened its doors, baffling its visitors with intricate architecture and exquisite goods. Following this, you can see the changing of the guards in the Alexander Garden, a ceremony held every day in honor of the fallen soldiers of the Great Patriotic War (World War II). 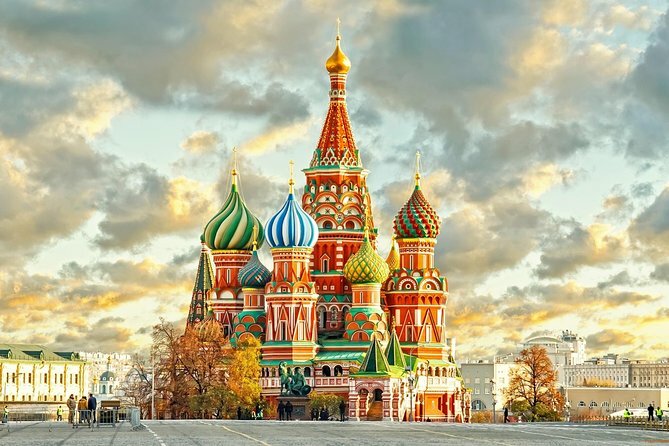 On this concise tour you will be able see the most famous Russian landmarks, whilst learning their history and taking pictures that will remind you of this magical place for years to come.